Limited Seating is available on all Trolley Tours! Book online to reserve your space. Cancellation Policy - By placing an order you are agreeing to the following Cancellation Policy – no Refunds are given for Cancellations, but tours may be rescheduled according to our Policies listed under each Tour. Reservations canceled within 72 hours of tour departure are 100% non-refundable and non-exchangeable. This cancellation policy is applicable for each tour, activity, or event within a transaction. Any changes to date or time will be accepted with no charge up until 72 hours prior to the tour, activity or event scheduled start time unless otherwise noted on individual tour descriptions and policies. Changes must be made by phone and will be subject to availability. If the preferred date or time of the change is not available then the standard cancellation penalty applies. Some tours have age and accessibility restrictions. Please verify before booking as you are responsible for reviewing our policies prior to placing a reservation. WAIVERS AND RESPONSIBILITY paperwork is available here and can be downloaded and printed. By making a reservation you agree to the Policies and Waiver as presented on this website. PLEASE ARRIVE AT LEAST 15-30 MINUTES prior to boarding. No Food is to be consumed aboard the Trolleys. Unruly behavior, shouting, abusive language, or any manner of disturbing others on Board is not permitted and guests will be asked to leave the Trolley at the discretion of the Driver or Host on board. We reserve the right to refuse service to anyone. NO refunds will be given if guests are asked to leave the trolley. All trolley guests must agree to this liability waiver. Welcome to Fredericksburg Tours. 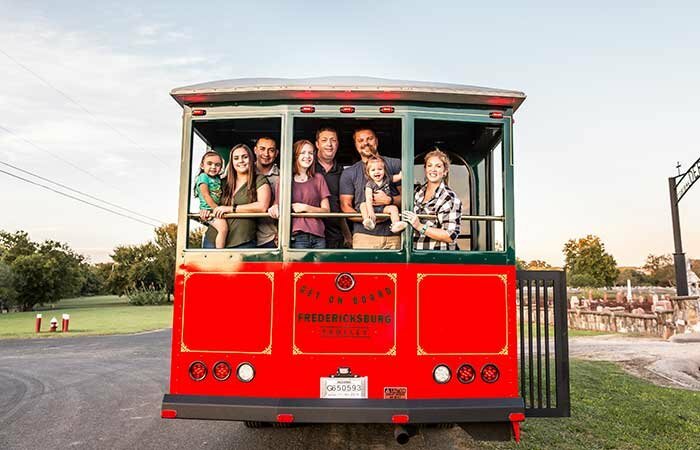 Our Vintage Style Trolley tours transport you back in time to the days of the early German settlers as they made the Hill Country area their new home - experience the history, architecture, important sites, and beauty with our narrated tours. 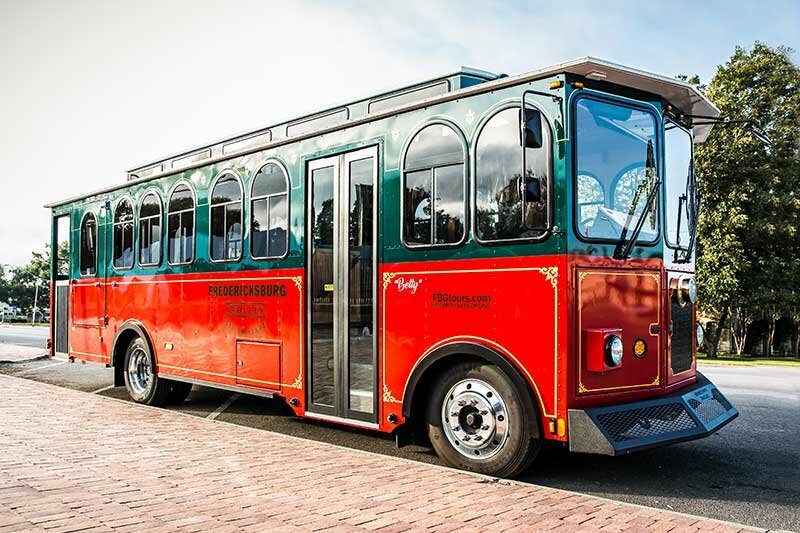 Charter our Trolleys - We are available for private group tours, weddings, families, schools and church groups, military reunions, corporate events, birthday and retirement parties, and shuttle services throughout our traveling area. Welcome to Fredericksburg Tours. 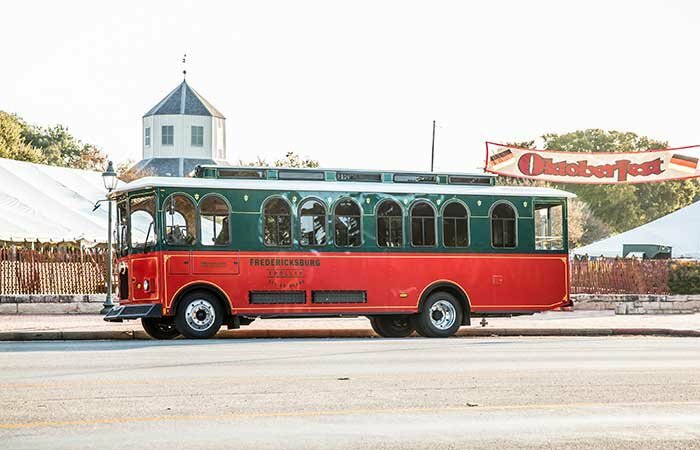 Our Vintage Style Trolleys, our Vintage Cadillacs, and our luxury shuttle tours transport you throughout the Hill Country area - experience the history, architecture, important sites, great dining and beauty with our narrated tours. Private Charters are available for private tours, weddings, families, schools and church groups, military reunions, corporate events, birthday and retirement parties, and shuttle services throughout our traveling area. Inquire at info@fbgtours.com for information and reservations. We are a locally owned and operated Company.